Nasal obstruction is one of the most common problems that brings a patient into a physician's office, and septal deviation is a frequent structural etiology. As a result, surgical correction of septal deviation (septoplasty) is the third most common head and neck procedure in the United States, and it generally is performed to improve quality of life. Presently, a variety of additional indications exists for septoplasty, from intractable epistaxis to harvesting cartilage for use in rhinoplasty (see Indications). 3500 BC: The Ebers Papyrus, which contains the first known mention of rhinologic surgery, was written around this time in Egypt. Most of the procedures depicted in it were reconstructive because rhinectomy was a frequent form of punishment. 1757: Quelmatz was one of the earliest physicians to address septal deformities. His recommendation included daily digital pressure on the septum. 1875: Adams recommended fracturing and splinting of the septum. Late 19th century: The most common operation in the United States was the Bosworth operation to correct nasal obstruction from nasal septal deviation. Using a specialized saw, the deviation was removed along with the corresponding mucosa. Results were suboptimal. 1882: Ingals introduced en bloc resection of small sections of septal cartilage. Because of this innovation, he is credited as the father of modern septal surgery. Around the same time, cocaine was becoming widely used in surgery. With its advent, anesthesia and hemostasis for nasal surgery improved significantly. Longer and more technically refined operations became feasible. 1899: Asch was the first to suggest altering the tensile curve of septal cartilage instead of resecting it. He proposed the use of full-thickness cruciate incisions. 1902 and 1904: Freer and Killian described the submucous resection (SMR) operation. This procedure is the foundation of modern septoplasty techniques. They advocated raising mucoperichondrial flaps and resecting the cartilaginous and bony septum (including the vomer and perpendicular plate of the ethmoid), leaving 1 cm dorsally and 1 cm caudally to maintain support. 1929: Metzenbaum and Peer were the first to manipulate the caudal septum, using a variety of techniques. The classic SMR was less effective in correcting this area of deviation. In addition, Metzenbaum advocated the use of the swinging door technique, and in 1937, Peer recommended removing the caudal septum, straightening it, and then replacing it in the midline position. 1947: Cottle introduced the hemitransfixion incision and the practice of conservative septal resections. Long-term follow-up studies of patients who had undergone SMR occasionally revealed dorsal saddling, retraction of the columnella, and alar widening; therefore, conservative resections during septoplasty were designed to avoid these complications. Submucous resection (SMR) is an extensive resection of cartilage and bone, including part of the vomer and part of the perpendicular plate of the ethmoid. A 1-cm caudal and dorsal strut is typically left to support the lower two thirds of the nose. Conversely, septoplasty is a tissue-sparing procedure. In most situations, the area of deviation is corrected or resected in order to leave behind as much cartilage and bone as possible. Cartilage resection is minimized, particularly when the deviation is located in a structurally vulnerable area (eg, caudal and dorsal regions). In such cases, the cartilage can be repositioned, reshaped, or recontoured using a variety of methods. Nasal obstruction is a common complaint. In 1974, Vainio-Mattila found a 33% incidence of nasal airway obstruction among randomly chosen adults. Septal deviation was found to be the most frequently encountered structural malformation causing nasal obstruction. Clinically significant septal deviation was found in 26% of patients with nasal obstruction in this study. Developmental septal deviation may occur. Patients in whom the septal cartilage has been damaged in the neonatal period and during birth can present with severe septal deviation in the absence of a history of nasal trauma. Microfractures sustained during late intrauterine life and during birth may cause weakness in the damaged side of the cartilage. The result is asymmetric bending of the cartilage toward the side of the injury, while the contralateral side achieves dominance over time. These conclusions are supported by evidence matching the direction of septal deviation with the presentation of the fetal head in the pelvis during delivery. Septal deviation from traumatic impact can occur in childhood or adult life. Childhood trauma can cause severe nasal obstructive problems in adult life because any degree of septal deviation usually becomes more pronounced with time. Depending on the direction and force of the nasal injury, septal cartilage can fracture horizontally or vertically, with single or multiple fracture lines, and can be accompanied by damage to the nasal bones or to the perpendicular plate of the ethmoid. In addition, the cartilaginous septum can subluxate from the vomeral sulcus. Usually, the junction of the bony and cartilaginous septum is the area of greatest deviation due to trauma. Septal cartilage provides structural support for the nasal dorsum while maintaining a remarkable degree of elasticity. It can absorb large amounts of force without permanent deformity. When the amount of force applied to the cartilage exceeds its biomechanical stress point, the cartilage fractures. In the absence of trauma, septal cartilage is usually straight. Each side of the cartilage has an internal tension that is evenly balanced. Traumatic injury usually causes asymmetric damage to the cartilage, resulting in the dominance of one side over the other. Over time, the dominant side of the septal cartilage exhibits marked overgrowth relative to the contralateral side. A deviation results, with the convex side exhibiting the dominant growth pattern. This is often the side ipsilateral to the injury. The magnitude of injury required to generate a significant septal deviation is inversely proportional to the patient's age. In childhood, particularly during the adolescent growth years, even insignificant trauma to the nose can produce unilateral microfractures that have severe impact upon the growth pattern of the patient's septal cartilage. Patients may present with a history of sinusitis, allergic rhinitis, obstructive sleep apnea, previous nasal surgery, or recent nasal trauma. They often relay symptoms of unilateral or bilateral nasal airway obstruction that is unrelieved with decongestants or nasal steroid sprays. On initial examination, external dorsal deviation may be evident, or the columella and caudal septum may be deflected off the midline. A history of prior nasal surgery should raise suspicion of mucoperichondrial scarring and previously resected septal cartilage. Ascertain a history of allergic rhinitis, cocaine abuse, and rhinitis medicamentosa caused by long-term use of decongestant spray. Medications (eg, estrogen, sympatholytics, beta-blockers) can cause nasal congestion. Environmental irritants and certain food allergies (eg, red wine, milk, beer) are also potential culprits. Inspect the nasal cavity before and after nasal decongestion. Anterior and posterior rhinoscopy is helpful in diagnosing the location, type, and severity of septal deformity. Prior to the examination, decongest the nasal cavity with a vasoconstricting nasal spray and anesthetize with a 4% lidocaine nasal spray (or equivalent). Some physicians insert 4% cocaine-soaked cotton pledgets into the nasal cavity to achieve the decongestive and anesthetic effects. Both the anterior and posterior septum should be evaluated. A zero-degree, 3-mm diameter rhinoscope may facilitate inspection of the posterior septum. The endoscope is also useful in identifying polyps, assessing the severity and extent of posterior septal deviations and bony spurs, and locating areas of septal perforation or mucosal injury. The size of the inferior turbinate should be noted during the inspection of the nasal mucosa both before and after the decongestant spray. Allergic rhinitis can present with pale, boggy mucosa with watery discharge. Vasomotor rhinitis, rhinitis medicamentosa, or cocaine abuse usually presents with thickened hyperemic mucosa. A narrow internal nasal valve can be assessed by lateralizing the nasal side wall with a nasal speculum or lateral digital pressure on the patient's cheek. Note any improvement with nasal breathing with these maneuvers. Consider elective septoplasty for patients who have a visible septal deformity but no other identifiable causes for their nasal obstruction (eg, polyps, allergies, turbinate hypertrophy, chronic lung disease) and in whom conservative management (eg, nasal steroid spray) has failed. When access to a posterior bleeding vessel is hampered by a severe deviation, perform a septoplasty first to gain posterior access for vessel cauterization or packing. When normal laminar airflow becomes turbulent secondary to a septal deviation, mucosal drying and crusting become more prevalent and can lead to intermittent epistaxis. Correction of the deviation can ameliorate this problem. Septoplasty is sometimes necessary to correct a septal deviation that blocks the ostiomeatal complex. An endoscopic sinus surgical procedure may follow. Telescoping tearing and dislocation of the septum is a frequent occurrence in closed nasal injuries. Dislocations most frequently occur at the junction between the quadrangular cartilage and the perpendicular plate of the ethmoid bone. Failure to address a malpositioned septum in nasal fracture reduction may lead to eventual nasal obstruction. The changes to the nasal structure that are a part of rhinoplasty can cause nasal obstruction in some patients unless the septum is straightened during the procedure. Additionally, the septum is an excellent source of donor cartilage for structural grafting in rhinoplasty. Pituitary tumor resection is possible through the transseptal-transsphenoidal approach. The septum provides dorsal support and helps to maintain the position of the columnella and nasal tip. It also separates the nasal passages and serves as shock absorption for the floor of the frontal fossa. The internal nasal valve is located at the caudal edge of the upper lateral cartilage. At this location, the upper lateral cartilage forms an ideal angle of 10-15° with the septum (see the image below). 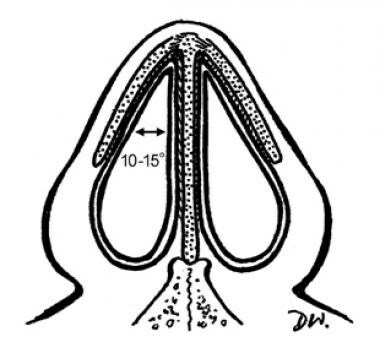 The cross-sectional area of the nasal cavity is narrowest at the nasal valve, which acts as a funnel to focus and direct air currents and thereby produces laminar flow. Untreated deformities or poor alterations to the area of the valve can cause the valve to collapse or lose its ability to direct the air stream. When airflow dynamics change, subjective sensation of air passage is reduced, and this tends to be perceived by patients as nasal airway obstruction. The subjective sensation of airflow has not been clearly elucidated, but receptors that are sensitive to changes in the laminar airflow pattern and airspeed are believed to be present at the valve. Cross-sectional area of the nasal cavity at the middle vault level. The ideal angle the caudal edge of the upper lateral cartilage makes with the septum is 10-15°. Blood supply is illustrated in the image below. The vasculature of the septum runs between the perichondrium and the mucosa. This subperichondrial space is the recommended avascular dissection plane when raising the mucoperichondrial flap during the first step in septoplasty. 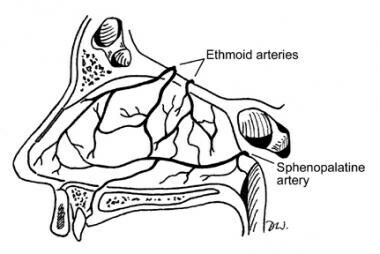 Blood supply to the nasal septum derives contribution from the anterior and posterior ethmoidal arteries, the sphenopalatine artery, the septal branch of the superior labial artery (not labeled), and the greater and ascending palatine arteries (not labeled). Superior blood supply is derived from the anterior and posterior ethmoid arteries, while posterior blood supply is derived from the sphenopalatine artery and the greater palatine artery. The septal branch of the superior labial artery supplies the caudal septum and columnella, and the inferior blood supply is derived from the palatine artery. Generally, the venous drainage pattern follows the arterial supply, except for a posterior communication with the cavernous sinus. Innervation is supplied by the anterior ethmoid nerve, nasopalatine branch, and the terminal branch of the anterior superior alveolar nerve. Vainio-Mattila J. Correlations of nasal symptoms and signs in random sampling study. Acta Otolaryngol Suppl. 1974. 318:1-48. [Medline]. Sedaghat AR, Kieff DA, Bergmark RW, et al. Radiographic evaluation of nasal septal deviation from computed tomography correlates poorly with physical exam findings. Int Forum Allergy Rhinol. 2014 Nov 20. [Medline]. Georgiou I, Farber N, Mendes D, Winkler E. The role of antibiotics in rhinoplasty and septoplasty: a literature review. Rhinology. 2008 Dec. 46(4):267-70. [Medline]. Sclafani AP, Kim M, Kjaer K, Kacker A, Tabaee A. Postoperative pain and analgesic requirements after septoplasty and rhinoplasty. Laryngoscope. 2019 Mar 7. [Medline]. Klinger F, Caviggioli F, Lisa AV, et al. Therapeutic effect of hyaluronic acid in reducing nasal mucosa recovery time after septoplasty. Ear Nose Throat J. 2017 Apr-May. 96 (4-5):E16-E20. [Medline]. Siegel NS, Gliklich RE, Taghizadeh F, Chang Y. Outcomes of septoplasty. Otolaryngol Head Neck Surg. 2000 Feb. 122(2):228-32. [Medline]. Samad I, Stevens HE, Maloney A. The efficacy of nasal septal surgery. J Otolaryngol. 1992 Apr. 21(2):88-91. [Medline]. Sundh C, Sunnergren O. Long-term symptom relief after septoplasty. Eur Arch Otorhinolaryngol. 2014 Nov 29. [Medline]. Reber M, Rahm F, Monnier P. The role of acoustic rhinometry in the pre- and postoperative evaluation of surgery for nasal obstruction. Rhinology. 1998 Dec. 36(4):184-7. [Medline]. Hardcastle PF, White A, Prescott RJ. Clinical and rhinometric assessment of the nasal airway--do they measure the same entity?. Clin Otolaryngol Allied Sci. 1988 Jun. 13(3):185-91. [Medline]. Hwang PH, McLaughlin RB, Lanza DC, Kennedy DW. Endoscopic septoplasty: indications, technique, and results. Otolaryngol Head Neck Surg. 1999 May. 120(5):678-82. [Medline]. Garzaro M, Dell'Era V, Riva G, Raimondo L, Pecorari G, Aluffi Valletti P. Endoscopic versus conventional septoplasty: objective/subjective data on 276 patients. Eur Arch Otorhinolaryngol. 2019 Mar 20. [Medline]. Kamami YV. Laser-assisted outpatient septoplasty results on 120 patients. J Clin Laser Med Surg. 1997. 15(3):123-9. [Medline]. Axial CT scan demonstrating severe septal deviation. Note left-sided deflection of caudal septum and right-sided nasal airway obstruction due to bony and cartilaginous posterior deviation. Location of the hemitransfixion and Killian incisions. Elevation of the mucoperichondrial flap with a Cottle elevator. (A) Transcartilaginous incision near the osseocartilaginous junction. (B) Excision of posteroinferior septal cartilage to achieve a swinging door effect. (C) Inferior strip excision of cartilage. The external nasal approach provides direct visualization of the anterior and dorsal septum and easy access for septal repair. One technique of incising the septal cartilage involves removing thin wedges from the convex side of the deviated septum to encourage midline repositioning. Excess and displaced septal cartilage along a hypertrophied maxillary crest can be excised. A straight osteotome may facilitate removal of the bony portion.